Zoku Pop is WONDERFUL!!!! My entire family has enjoyed making the Zoku pops. The combinations are endless. This product is so user friendly with heavy duty construction, easy clean up and requires very little storage space. I don't have to worry about storage because mine is in use daily. We first tried the original Zoku Pop Maker and loved it so much I asked if w could try the Zoku Fish Pop Molds Maker. My kids love the fun fish designs; adding kid friendly designs is the only way I see Zoku could have improved on their product. As a mother I am very pleased because this product has changed my children's unhealthy snack habits to nutritional snacks such as orange, coconut, and pineapple pops. I would also like to mention that their is nothing wasted an open can of soda turns into a Dr. Pepper pop!!!!! I love it!!!!!! Check out all of the great Zoku Recipes here. I think this Mint Julep looks great choose your favorite and try it out! DIRECTIONSIn a small saucepan, heat water, sugar and mint leaves over medium heat. Stir until sugar dissolves completely. Remove from heat and let cool completely. Discard mint leaves. In a small pitcher, mix together 3 oz of the mint simple syrup, 3 oz whisky and 14 oz of flattened club soda. Pour into Zoku Classic Pop molds. Place handles in Zoku Classic Pops and freeze for 8 hours. Run Zoku Classic Pops under warm water for a few seconds to help release pops. Classic Pop Molds lets you create six pops in a classic shape but can easily be used with the Zoku Fish Pop Maker but pop amounts may vary. These look so fun!! 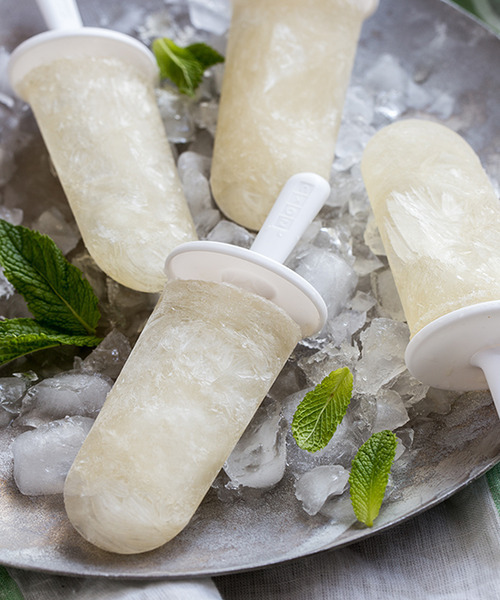 The mint julep intrigues me-Im not a huge fan of mint but my hubby and 2 of my boys are huge fans and I think these would be a big hit!